Magnesium Deficiency = Higher Risk for Diabetes Mellitus? New Study Confirms Link. Diabetes mellitus is a disease in which the body does not produce or does not utilize insulin effectively. A new research study out of Brazil, adds to the growing evidence that magnesium deficiency is linked to diabetes mellitus risk and complications. Magnesium has been found to regulate and improve blood sugar control and those who are low on this mineral increase their risk of developing diabetes mellitus considerably. Los Angeles, CA — A new study from Brazil, scrutinized magnesium intake and blood levels in 51 type 2 diabetes patients. Blood sugar (glucose) tests were done which measure the levels of glucose in the patient’s blood. One such test is the “fasting blood sugar test” which measures blood glucose after you have not eaten for at least 8 hours. Usually, blood glucose levels increase a bit after eating. This increase causes the pancreas to release insulin so that blood glucose levels do not get too high. Blood glucose levels that remain high over time can damage eyes, kidneys, nerves, and blood vessels. The study found that those patients with lower fasting and after-meal blood glucose levels had higher blood magnesium levels while those patients with higher fasting glucose levels had lower blood magnesium levels and higher urine levels of magnesium. A full 82% of the diabetics studied showed that magnesium intake was insufficient with the lowest levels found in those with kidney complications. About 62% of the patients had low blood levels of magnesium. The researchers noted that because magnesium is so vital to energy supply and utilization in the body, they were not surprised to find that lower levels of magnesium in the blood lead to metabolic malfunctions such as diabetes. They also concluded that the impaired kidney function connected with diabetes mellitus might explain the higher levels of magnesium in the urine, which combined with insufficient magnesium intake, caused the high blood sugar levels. 1. Include frequent small meals of protein (fish—especially wild salmon, to avoid mercury—and free-range chicken and meat) and complex carbohydrates (whole grains, legumes, and vegetables), as well as the avoidance of simple sugars and white flour. 2. Use stevia as a natural sweetener which comes from the leaves of a plant that grows in South America and avoid the sugar substitute aspartame, which can worsen blood sugar control and cause weight gain, headaches, nerve damage, and eye damage, because it is made partly from wood alcohol, which breaks down to formaldehyde. 3. Supplement with an absorbable form of magnesium. You cannot get sufficient magnesium from foods alone due to the depleted soils and processed foods that our modern diets consist of. Not all forms of magnesium are absorbable by the body. One of the most absorbable forms of magnesium that is safe is magnesium citrate in powder form. Is magnesium the next miracle cure? Those who wonder if they are magnesium deficient can now get real answers. 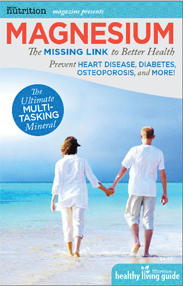 Discover exactly how magnesium helps one’s health via a free, 32-page guide. Just go to the non-profit www.nutritionalmagnesium.org and claim instant access. There is zero cost. The non-profit Nutritional Magnesium Association (NMA) is a trusted authority on the subject of magnesium deficiency and the benefits of nutritional magnesium for a variety of health issues. Radio, TV, magazines and professional journals interview its members regularly — including ABC, NBC and CBS. The mission of the Nutritional Magnesium Association (NMA) is to disseminate timely and useful information on the subject of nutritional magnesium so as to improve the lives of all people affected by the widespread deficiency of this mineral in our diets and the related health issues associated with this deficiency. The ideas, procedures and suggestions contained in this press release are not intended as a substitute for consulting with your physician. All matters regarding your physical health require medical supervision. Neither the author nor the publisher shall be liable or responsible for any loss, injury or damage allegedly arising from any information or suggestion in this article. The opinions expressed in this article represent the personal views of the author and not the publisher.